The South Dakota Department of Labor and Regulation is committed to providing quality services to assist individuals with disabilities find employment. We also serve as a resource for businesses as they benefit from the talents these individuals offer through employment. Disclosing a disability is a difficult decision for job seekers and employees, but it is a personal decision. The Disability Disclosure video highlights South Dakotans and their decision to disclose their disability to a post-secondary institution or employer. Visit the Job Accommodation Network to receive individual consultation regarding job accommodations. Universal Design (UD) is a strategy for making products, environments, operational systems and services welcoming and usable to the most diverse range of people possible. If you have an employee who needs an assistive technology accommodation, DakotaLink serves the entire state of South Dakota with assistive technology needs. Find out through the Internal Revenue Service about tax benefits for businesses who have employees with disabilities. ADA.gov is the U.S. Department of Justice, Civil Rights Division's website. It provides Information and Technical Assistance regarding the Americans with Disabilities Act. The ADA National Network provides information, guidance and training on the ADA that is tailored to meet business needs. This is a supportive resource and not an enforcement agency. The ADA Business Connection provides ADA compliance resources for businesses. The U.S. Department of Labor's Office of Disability Employment Policy develops and influences disability employment-related policies and practices affecting an increase in the employment of people with disabilities. Disability and Employment Community of Practice Employer Resource Library is an online learning destination for the business sector, which provides services and programs to people with disabilities and/or other challenges to employment. Employer Assistance & Resource Network (EARN) provides free technical assistance, consultation and training for employers on all aspects of the employment of persons with disabilities. U.S. Small Business Administration provides a summary of resources encouraging the recruitment of hiring of people with disabilities for employers. U.S. Department of Labor elaws is a website designed to help employers determine which nondiscrimination laws apply to their business or organization. 30-Second Trainings are designed to educate businesses about proven strategies and easy-to-use resources that can assist in retaining existing employees who experience onset of a disability. These tools also provide valuable information to business including strategies and resources that can assist in effectively accommodating all employees in achieving their maximum potential and productivity level. The South Dakota Division of Rehabilitation Services can help individuals with disabilities to obtain or maintain employment, economic self-sufficiency, personal independence and full inclusion into society. The South Dakota Department of Labor and Regulation has information on labor and employment laws. Workforce Diversity Network of the Black Hills (WDNBH) is a team of business and human resource individuals to serve as a link between employers and individuals with disabilities who have the desire and qualifications to work. Members of WDNBH recognize that a healthy workforce is diversified and inclusive of persons with disabilities. The Business Resource Network in Sioux Falls provides businesses with education, awareness and resources to promote the successful employment of persons with disabilities. Ability for Hire is a South Dakota movement about changing perceptions. It's about seeing the ability in a person instead of the disability. When you do, the possibilities are endless. Share this message with someone you know today. DakotaLink serves the entire state of South Dakota with assistive technology needs. 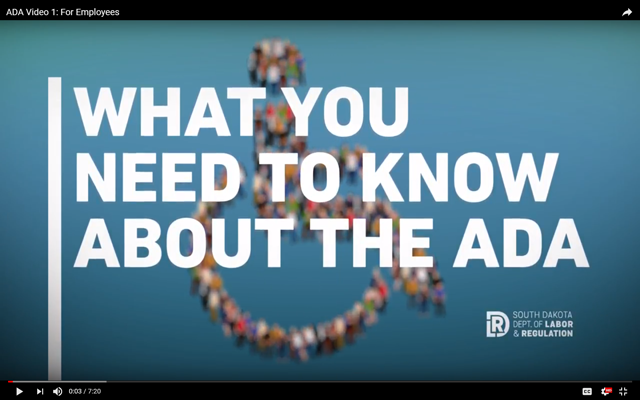 View the What you Need to Know about the ADA video on YouTube to learn about protections under the ADA and expectations for communication regarding a disability, as well as etiquette tips when working with or providing services to those who have a disability.